When determining how much atorvastatin will cost you without insurance, there are a few things you can do ensure you are going to pay the best price. 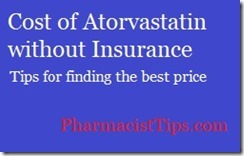 Without insurance atorvastatin could cost you $50 or more, but use my price checker to find a better price. The discount card is free, just print a copy or screen capture it and show it at the pharmacy. Also many people save money by cutting atorvastatin in half. Ask your pharmacist if your dose could be cut in half. And, read my post about cutting tablets. Buy a larger quantity may also save you money, ask your pharmacy for a price quote for 30 and 90 tablets. Often there is a price break for more tablets. Medication can be expensive, using a discount card can get you a fair price and make you medications affordable. Always talk to your doctor or pharmacist if you are having difficulty affording you medications, there may be less costly alternatives.